All the animals go on a shopping spree and try on lots of different pieces of clothing. Hippo has a hat, a cat wears a cardigan, camel finds a coat, pig tries on some jeans, and more! You've never seen a fashion show like it. 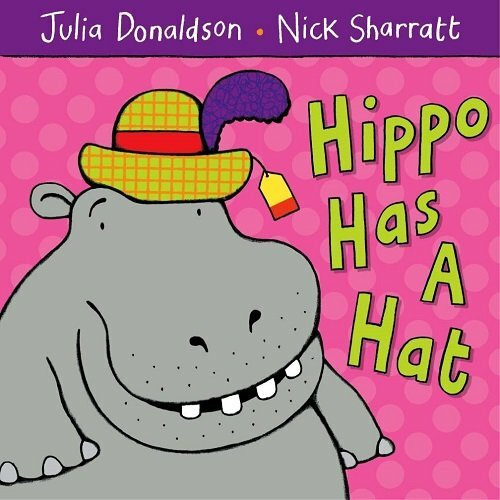 Hippo Has a Hat is a silly rhyming book with short sentences. The colourful illustrations and rhythmic sentences engage young children in listening and joining in with the story as they label all the different animals and pieces of clothing. Children will love trying to guess which animal will come next by the glimpse you get on each page (e.g. a spotty tail, a striped leg, a pink feather). For further speech and language targets in Hippo Has a Hat, see the list below.